This is Bandier's new Flatiron location. This store presented an interesting challenge as it blends typological lines between retail, hospitality and corporate that span two floors. Located in the former Paul Smith shop, this store houses retail on the first floor along with a cafe. In the basement we have designed a Sneaker Cafe where customers can shop for shoes while sampling the offerings from Bandier's cafe partners, Broken Coconut. We wanted to make shopping for sneakers a relaxed, elevated and social experience. Come to the store to shop but also have a seat, read some magazines, and enjoy the company of friends. The room is lined with banquettes for sitting to have a bite to eat and try on sneakers. In the center of the room an arrangement of under-lit perforated steel plinths displays product. Arched mirrors around the perimeter create an echo chamber of reflected images so shoppers can sneak a peek of themselves at every angle. For this store we developed a new material palette for the brand by focusing on light and dynamic materials that speak to Bandier's fresh take on fashion. White powder-coated perforated steel, Corian and mirror mix with concrete and brass to provide a balanced backdrop to their apparel. For an active wear brand, movement is key. We designed minimal fixtures with maximal dynamism. As you move around the perforated fixtures they produce moire patterns and mottled shadows in the space. 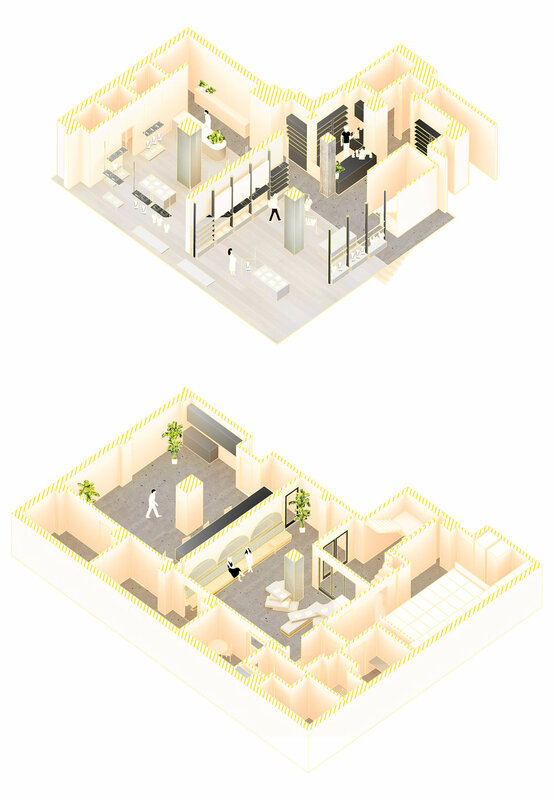 This is the first of three new stores we are currently designing for Bandier. Stay tuned for a new Bandier Flagship in New York, along with a new Bandier Flagship in Los Angeles. Both stores are slated to open late this summer.